What do all those “Degree Requirement” letters mean? Counts as a track core for the Politics and Policy in the Global Economy track, electives in the Global Security track and Culture track, and as the core course for the Development Economics certificate! 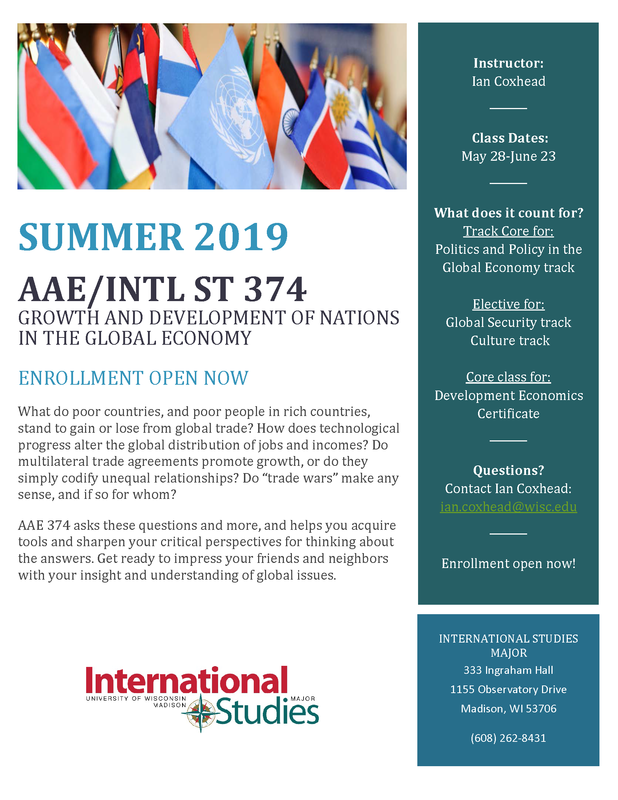 Enrollment for Summer 2019 open now. 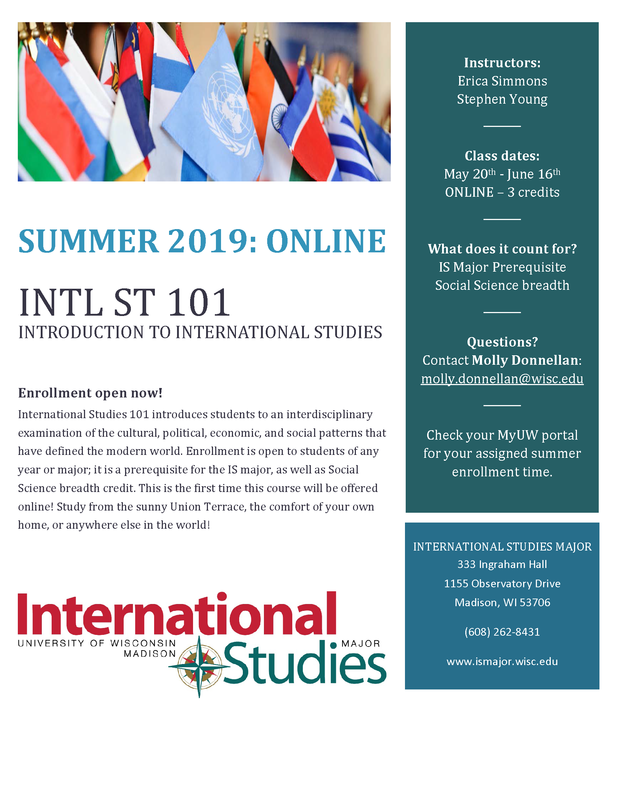 We are excited the announce that for the first time, INTL ST 101: Introduction to International Studies will be offered online during the Summer 2019 term! The course will be taught by Professor Erica Simmons (Political Science) and Professor Stephen Young (Geography); both recipients of Distinguished Teaching Awards. This course introduces students to an interdisciplinary examination of the cultural, political, economic, and social patterns that have defined the modern world. It also counts as a prerequisite for the International Studies Major, and counts toward Social Science breadth requirements. Stay Connected with the IS Major! The International Studies Major is an interdisciplinary program with areas of specialization in Global Security, Politics and Policy in the Global Economy, and Culture in an Age of Globalization. Students select one of these three tracks for specialization. Each track allows students to become familiar with contemporary academic debates on global issues and to begin to engage in those debates. Globalization has never been more central to the human condition. National security, national and global economies, human rights, natural resources, sustainability, and the global flows of technology and imagery are all part of International Studies curriculum. There are several ways that you can declare the International Studies Major. Before declaring the major, you need to attend an Intro to the IS Major Workshop and you need to show good progress towards completing the prerequisites for the major. Students interested in declaring may do so at an Intro to the IS Major workshop, during walk-in hours, or by scheduling an appointment with the Peer Advisor. Please fill out this IS Major – Declaration Information Form and bring it with you when you declare. The IS Major has three tracks that students can choose to focus on. Global Security: Causes and solutions to political crises, violent conflicts, and human rights challenges in interstate, transnational, and domestic settings. Politics and Policy in the Global Economy: Policy issues pertaining to international commerce and trade, aid and development, and related environmental and natural resource problems. Culture in the Age of Globalization: Cross-cultural interactions at different levels: local, national, and transnational, and the impact of globalization on cultures. The International Studies Major was created in 1936 as the International Relations Major to help prepare students to work for the Foreign Service. Originally the major’s focus was on American foreign policy, but over time grew to encompass various regional tracks. After the end of the Cold War, the program adapted to reflect the changing global and methodological landscape. In 1999, the International Relations Major officially became the International Studies Major and included perspectives of various disciplines outside of Political Science. Today, the International Studies Major incorporates more than 40 different departments to offer a comprehensive view of the contemporary world. The International Studies Major is focused on undergraduate education in a liberal arts tradition. We value undergraduate teaching and learning; as such graduate students are not permitted in International Studies courses. Feedback, questions or accessibility issues: molly.donnellan@wisc.edu.